If you’ve been wanting to try Elder Scrolls Online but been waiting for a sale here’s one you won’t want to miss. You can now get the base game 50% off and the Summerset chapter up to 40% off. Marking their 25th anniversary of the Elder Scrolls universe, Zenimax have put their Elder Scrolls Online base game on sale, you can now pick up the standard edition 50% off which works out to be $9.99 and this across all platforms. ESO is available to play on PC, Xbox One and Playstation 4. You can get this deal through a number of online retailers including the ESO store, Steam, Amazon, Best Buy, Gamestop and Walmart. 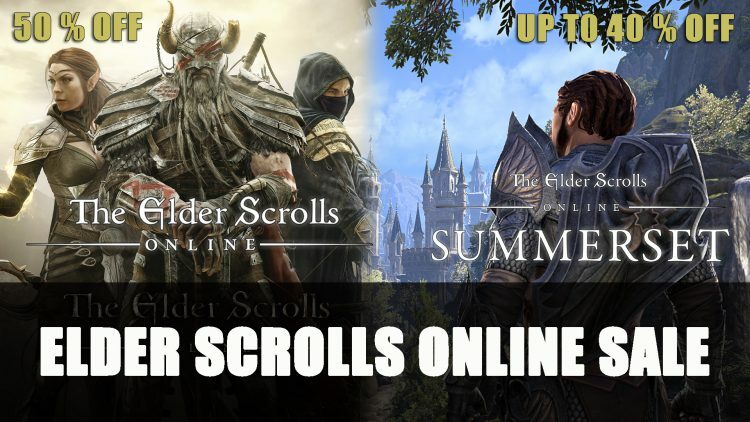 You also pick up the Summerset chapter for 40% off which is $11.99 for the digital upgrade and $17.99 for PC, $20.99 for console on Xbox One as well as PS4 for the digital collector’s edition upgrade. This is available digitally only through the Playstation Store, Xbox Store, as well as for PC through the ESO Store, Bethesda.net and Steam. The Summerset expansion explores the Isle of Summerset, which recently has been opened up by the Proxy Queen Alwinarwe, which allows the player to explore a new adventure. The chapter includes new additions such as the Psijic Order Skill Line and Jewelry crafting. Sales will end on April 2nd so catch them while you can! For all your Tamriel adventuring needs be sure to check out our Elder Scrolls Online wiki! If you’re new to Elder Scrolls Online be sure to check out our guides section as they are a great way to get you started. You also check out the Elsweyr prologue quests. If you want to try before you buy, you also enjoy the free play event which will commence on March 28th.